ST. PETERSBURG, Fla. -- Drivers navigating a largely powerless Tampa Bay have encountered dozens of intersections without traffic signals since Hurricane Irma rolled through overnight Sunday into Monday morning. With more than seven million people across the state without power , utility companies and public officials expect the repairs to take days -- even weeks in some areas. For locals venturing out to work or to restock supplies, this presents a danger for anyone not paying full attention to intersections without power. 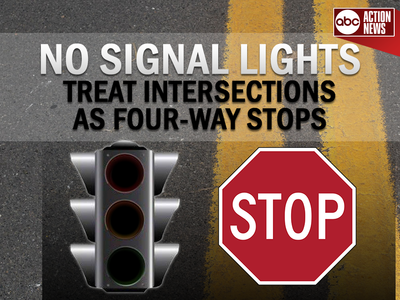 If you’re out on the road and encounter a traffic light that isn’t working, you’re to treat it as a four-way stop. Officials advise you pay extra attention to areas you aren't familiar with, but also always assume cross-traffic will not notice the traffic lights are out. As drivers returned to the road and returned home from evacuations to powerless neighborhoods, there were multiple crashes throughout the day Monday. Responders reported no serious injuries. Police in St. Petersburg have deployed officers around the clock to direct traffic until power is restored. The county’s Emergency Operations Center has called for an additional 200 traffic control officers to help man the intersections. Follow our continuous coverage as the Tampa bay community recovers in Irma's wake.